My Calorie Counter is powered by EverydayHealth, and it’s hard to separate the two. 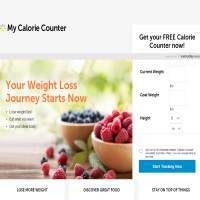 My Calorie Counter provides a set of tools which allows you to track and monitor your nutritional intake each day, building meal plans and recording your weight. It produces varied diets for your nutritional needs, showing you precisely how many calories you have left remaining each day. What’s more, it’s completely free. If you take a look at the list of features for this website, you’ll see that the site provides a lot of information to its users. That’s because My-Calorie-Counter, combined with Everyday Health, offers a really great amount of useful resources and articles. It’s not just about dieting, either. You can also find information on fitness, medical problems, sexual health, family and more. You can choose which elements you’re interested in and select to receive regular updates via email, which means you’ll never miss out. The great thing about this surplus of information is that your food recommendations and advice are tailored to your specific requirements. So, if you have diabetes, for example, it takes that into account when recommending foods. You can then subscribe to receive information on other issues such as heart disease or high cholesterol, and take that information into account when choosing what to eat. There are plenty of foods listed in the database, and the meals recommended are varied. You can easily adjust how many calories you can eat per day, and the recipes will change accordingly. Alternatively, you can plan out a week’s (or longer if you wish) worth of meals in advance to make sure you’re getting all the nutrients you need. So, in terms of food, My Calorie Counter and Every Day Fitness do a good job at making sure you’re eating well. When you sign up, you can include your basic details such as gender, height and weight, plus your target weight. The system will then calculate how much you can eat, and make recommendations. We couldn’t find a shopping list generator, which is a bit of a pain if you need to print out what you’ll need for the week. Also, the site wasn’t quite so impressive when it came to exercises. These were lacking, although you can read about exercises in the various articles and posts around the site. There are several community features to take advantage of, including a buddy system. This allows you to find an online partner to share your experiences with, offering motivation when you need it. You can also chat with other members online, sharing recipe ideas, workout regimes, grumbles and more. Although My-Calorie-Counter.com isn’t perfect, it does a lot right. If you’re mainly interested in losing weight and staying healthy through eating wisely, this site has a lot of really good tools and resources to use for free. If you’re more interested in exercise, we’d recommend combining this site with another which has more in the way of workout schedules. So, My Calorie Counter doesn’t have it all, but it has plenty to keep us coming back to. It’s all free, so there’s nothing to lose – give it a go!